As a professor and youth director, author Dan Dumas has seen that young people have high expectations for themselves. They want their lives to matter, and there's no reason our expectations for them should be any different. This book presents practical tools and biblical advice to middle school and high school-aged readers so they can make the most of their youth. It covers everything from making the right friendships to how to think about education and how to invest in their relationships with God. The habits a person forms when they're young can last a lifetime--now's the time to make it count. This book is ideal for parents and youth pastors to give to young people to read on their own or study in groups. 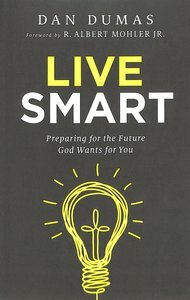 About "Live Smart: Preparing For the Future God Wants For You"
Dan Dumas has served as a college pastor for fourteen years with extensive experience discipling young people. Dan serves as a senior vice president at The Southern Baptist Theological Seminary, where he teaches and provides leadership for youth conferences (RENOWN and D3). He also teaches classes at Boyce College. Dan lives with his wife and children in Louisville, Kentucky.